At least 36 Islamist prisoners have died in Egypt during an apparent attempt to escape during their transfer to a prison outside Cairo. The interior ministry gave conflicting accounts of the deaths, initially saying the men died from gunfire during an attack by unidentified gunmen. The Muslim Brotherhood described the incident as "cold-blooded killing". European Union ambassadors are due to meet to discuss the crisis, in which at least 830 have died since Wednesday. On Sunday, the head of Egypt's armed forces said that "there is room for everyone" in Egypt, including supporters of ousted President Mohammed Morsi. But he said they had to "revise their national position". 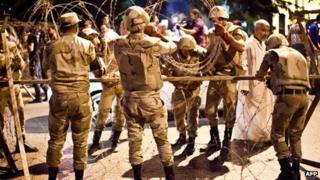 But Gen Abdul Fattah al-Sisi also warned the military would not tolerate unrest. The interim government says the Muslim Brotherhood has carried out a campaign of terror since Mr Morsi's overthrow on 3 July - which Morsi supporters call a "coup". On Wednesday the army moved against two encampments of Morsi supporters in Cairo, unleashing a wave of violence in the deeply divided country. Initially, the interior ministry said the detainees died in an exchange of fire after some of them took a military officer hostage and a convoy of prison vehicles, transporting a total of 612 detainees to Abu Zaabal prison in Qalyubia province, was attacked by unidentified gunmen. But later the ministry said the prisoners died from the effects of inhaling tear gas, which was fired when the escaping detainees took a police officer hostage. He was freed, but was badly injured, the military's statement added. A legal source told the Reuters news agency that the detainees had suffocated in the back of a crammed police van. And officials speaking on condition of anonymity to the Associated Press news agency said that not all the detainees belonged to the Brotherhood. The Muslim Brotherhood said 35 people had died. "The murder of 35 detained anti-coup protestors affirms the intentional violence aimed at opponents of the coup, and the cold-blooded killing of which they are targets," it said in a statement in English. More than 1,000 Brotherhood members have been detained in raids since Wednesday, with security sources saying about 300 were held in several cities on Sunday, including Cairo, Alexandria, Assiut and Suez. The interior ministry says so-called "people's committees", which have been set up by residents of some areas to provide security, would be banned because some had been used for vigilante activities. Moves to quash resistance by the Muslim Brotherhood have had only limited success, with some marches planned for Sunday cancelled but protests reported in Cairo, Alexandria, Ismailiya and Assiut. More than 830 people, including 70 police and soldiers, are reported to have been killed since Wednesday. Unrest is continuing in the Sinai Peninsula, the Agence France-Presse news agency reported, with a civilian, two soldiers and a police officer killed overnight on Saturday. However, there was some return to normality in the capital on Sunday, with streets busier than they have been in recent days, banks reopening and trading resuming on the stock market - where shares fell 3.9%. A curfew remains in place however, and the streets are once again deserted after 19:00 (17:00 GMT). The violence has sparked harsh international condemnation - though Saudi Arabia and Jordan have both expressed support for Egypt's "fight against terrorism". Ambassadors to the European Union's Political and Security Committee are expected to meet in Brussels at about 08:00 GMT on Monday. In a statement, European Commission President Jose Manuel Barroso and the president of the European Council Herman Van Rompuy said the EU "will urgently review in the coming days its relations with Egypt". Expressing regret that international efforts to find a peaceful way forward in Egypt were abandoned and a "course of confrontation" instead pursued, the statement concludes: "This path will not succeed. It is crucial that violence ends immediately. "The calls for democracy and fundamental freedoms from the Egyptian population cannot be disregarded, much less washed away in blood." There are calls for the ambassadors' meeting to be quickly followed by a full meeting of European foreign ministers. The EU has pledged several billion dollars in loans and grants to Egypt, but some countries are now calling for this aid to be frozen. Are you in Egypt? What has been your experience over the last few days? You can send us your comments using the form below.